If you’re a fan of college football, you may have heard about the freshman quarterback from Clemson who played through a knee injury and ended their 5-game losing streak against South Carolina. Deshaun Watson led his team to a 35-17 victory over the Gamecocks, and did it all with a partially torn ACL and bone bruise. While remarkable, Watson’s victory could have come at a serious cost. If not properly treated, ACL tears and bone bruises can lead to further joint and bone damage. If you suspect you or your child could have a bone bruise, come to FastMed for quick and affordable treatment. Bone bruises are more painful and last longer than the “boo-boo” bruises we’re accustomed to. That’s because bone bruises are borderline fractures. When your bone is hit by something, the fibers in the cortex of your bones break and let out their contents. If a lot of fibers break, it is considered a fracture; when only a few break, it is considered a bone bruise. If you have a bone bruise, it probably seems like the pain lasts forever. It takes a while for a bone bruise to heal, and your recovery time depends on how severe the bruise is, as well as your overall health. Minor bruises may go away in a few days, but more severe bruises could last up to several months. Bone bruises won’t show up on an x-ray, but x-rays can rule out the presence of a fracture. If you are suffering from a sports-related injury, or suspect you have a bone bruise, FastMed can help. All FastMed clinics are equipped with x-rays, so you won’t have to leave the office to find out whether you have a fracture or a bruise. If you live in Arizona, you can even make an appointment at one of our clinics that offers our Sports Medicine Program, where our staff specializes in treatment of sports related injuries. 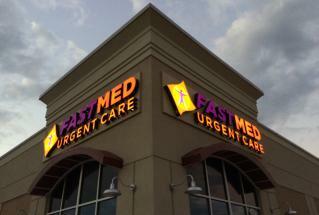 If you don’t have a FastMed clinic that offers our Sports Medicine Program near you, don’t worry! Our staff in North Carolina and Arizona are trained in adult and pediatric urgent care, and we offer treatment for sports injuries and other orthopedic concerns.